The European championship have kicked off two weeks ago with goals rolling in from all cylinders, teams like Portugal and Belgium have been given a big bunch by Austria and Italy but all cannot be complete without making mention about the European champions Spain who have been scintillating and eye catching so far in the group stages. The ‘La Roja’ as they are known as have brought glamour and beauty to the on-going Euros and has attracted attention following their flawless victory against Turkey. For sure passions and expectations have been elevated and the watching world are beginning to believe that the European champions (Spain) have the credentials to retain their crown. 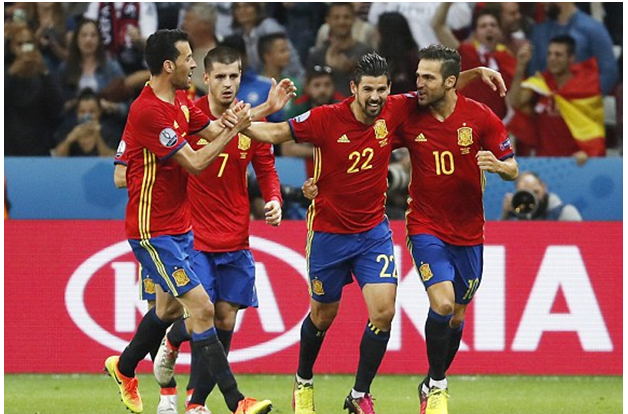 On this note we highlight why Spain are Euro 2016 favourite for the title. A trademark for the Spanish dominance on the field of play. 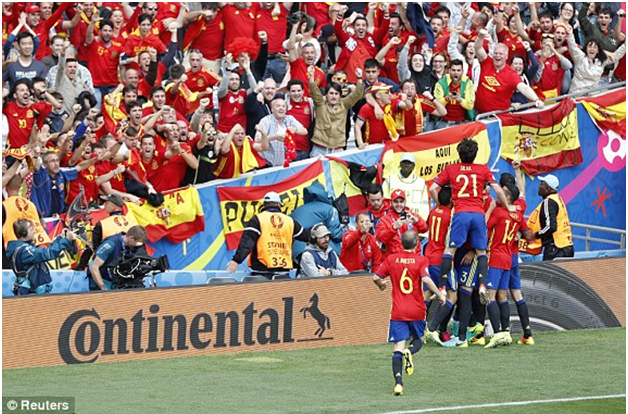 The Spanish side have played one of the best game (football) in the tournament, if not the best to say the least. This is justa testament to team chemistry that exist between the players. 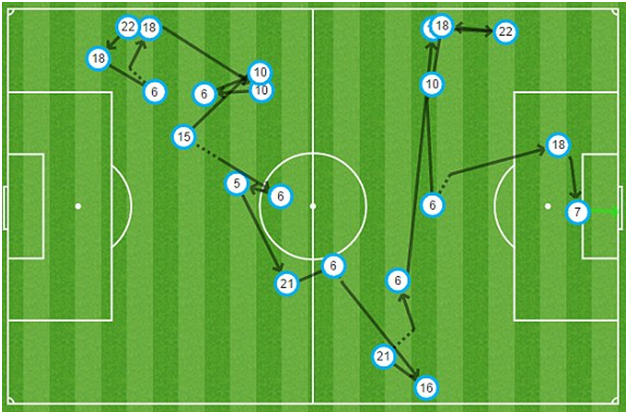 The ease and flair with which the Spanish side under the midfield influence of Iniesta and Cesc Fabregas pass the ball into opposing defence is very much worthy of applause and recognition. The tiki-taka style that enables Spain to string passes together ,keeping the possession of the ball much to the delight of watching world is a strong force that lead to total dominance and frustration of the opposing team who barely get on to the ball to initiate an attacking move. The likes of Iniesta, David Silva and Sergio Busquets have down exceptionaljob in midfield areas, keeping opposing midfielders at bay and initiate goal scoring chances from which Veteran Star Iniesta picked put Gerard Pique for the winner in the opening game against Czech Republic which is a sure sign that the Spanish outfit really mean business and are going places possibly to retain the title. 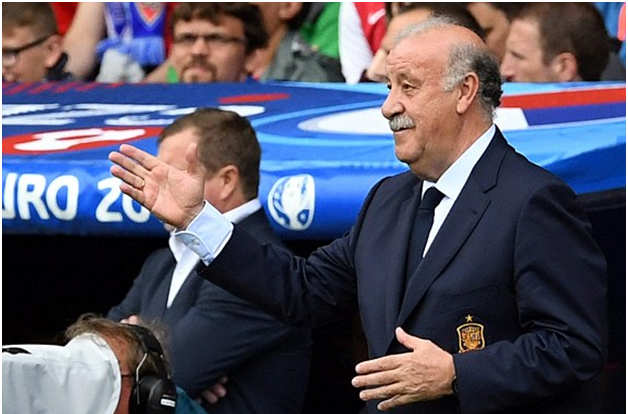 Spain coach Vicente Del Bosque during the match. This is one of the tool that the Spanish team has adopted for the last couple of years and is surely the bedrock of their undisputed progress over the year’s .Present Spanish Coach Del Bosque took over the helm on 1st July 2008 after the 2008 Euro winning coach resign on mutual consent. Del Bosque steered the team to back to back champions’ title in (2010 world cup and 2012 Euros) and look likely to help La Roja complete a treble in France. transition following the exit of midfield duo of Xabi Alonso and Xavi Hernandez along David Valla to name a few. The injection of younger talent like, Koke, Alvaro Morata and the youthful Arsenal right back Hector Bellerin are product of continuity which have enabled to Spanish side remain viable and able to lift the trophy, Cesc Fabregas is an apt example of Spanish midfielder that have linked players of different generation in transition due to the continuity which is a norm for the Spanish side and this just paying off as their teams is not any way lacking in experience. Nolito (22) celebrates with Cesc Fabregas (10) after scoring just three minutes after Alvaro Morata’s header. The Spanish squad is made up of world beater in all ramifications. Player like Andres Iniesta, Cesc Fabregas, Sergio Ramos to name but a feware perennial Champions at club level winning title from the Premier League in England, to the UEFA Champions League and all the numerous Spanish laurel won by the Barcelona faithful’s with Sergio Busquets inclusive are all pointers to what the Spanish side are capable of doing as a team and on an individual level. The Spanish side are not bereft of winning mentally and as Champions on individual scale know what it meant to win a championship and how to cope with the presume that comes with it on tactical ground, players like Cesc Fabregas and Iniesta have always formed the backbone of a triumphant side over the years at club level (Barcelona and Chelsea notably) and possess the Charisma and character to catalyze any side to the European crown especially with Fabregas who same on from the bench to replace Alonso in the World cup final to create a room for Andres Iniesta to break the heart of the Dutch by sealing an injury time win. 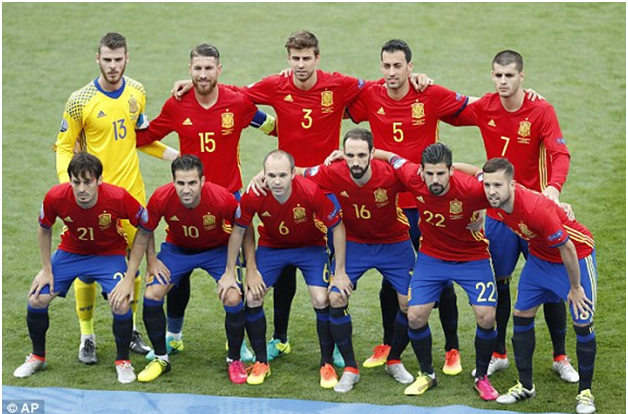 Such experience and exposure of champions and how to win title that exist among the Spanish players will go a long to instigate a likely success in the EURO 2016 as event on folds. Star studded Spanish line up brimming with abundance of talent. Though teams like Italy, England, Belgium and host France possess an array of talent in their respective squad with names like Wayne Rooney, Danielle De Rossi, Eden Hazard,Dimitri Payetand Kevin De Bruyne all expected to pull the strings for the aforementioned team but the Spanish side possess a depth of talent which is a component of their own that makes the euphoria in the team to be basking in real confidence. The depth of talent where Gerard Pique, Juan Fran and David Silva with efficient young and most sought after forward in the person of Álvaro Morata is an indication that Spain have enough Arsenal in their hands for run down any footballing opposition on attacking talent like Juan Mata, is at Alcorcon Isco and Fernando Tomes who had a five season of top side like Man United, Real and Athletic (Madrid) was left out of the 23 man squad barring injuries is surely an embarrassment of riches that not many teams can boast of, and such quality can stimulate confidence among the physical and technical crew and strike fear and signs of defeat to any impending opposition irrespective of the Spanish weaknesses. their crown possible for keeps for the third turn is a row to catalyze a clean sweep and confirm the dominance of their era on the European stage. The Spanish team celebrated the first win over Czech Republic 1-0 after outclassing the Czech side who were just comfortable packing men behind the ball in a special way signal to the watching world what there intentions are which is to win the tournament and the desire cannot be hidden as Morata celebrate his goal against Turkey with personal interest and satisfaction. Though the “La Roja” may have lost 2-1 to Croatia but that was as a result of certain level of complacency that cloud the human nature but all in all the Spanish players especially the young lads are not lacking in severe passion to overcome their football contemporary when they take to the pitch in the knock out stages possibly against Italy.